The Humphrey School of Public Affairs is located on the University of Minnesota’s West Bank on the Minneapolis campus. If you’re staying at the hotel, it is a short three-block walk away. 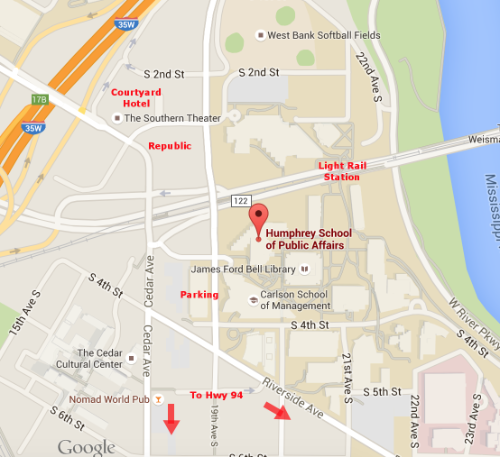 Here’s how to get to the venue if you’re coming in locally. From I-35W southbound: Exit at Washington Avenue and turn left on Washington. Washington will turn to the right and become Cedar Avenue two blocks later. Take Cedar south for three blocks, then turn left onto Riverside Avenue. The entrance to the parking garage will be in the middle of the block on your left. From I-35W northbound: Exit at Washington Avenue and turn right on Washington. Washington will turn to the right and become Cedar Avenue one block later. Take Cedar south for three blocks, then turn left onto Riverside Avenue. The entrance to the parking garage will be in the middle of the block on your left. From I-94 westbound: Exit at Cedar Avenue and turn right on Cedar. Take Cedar north for three blocks, then turn right onto Riverside Avenue. The entrance to the parking garage will be in the middle of the block on your left. From I-94 eastbound: Exit at Riverside Avenue and turn left on 25th Avenue South. Take 25th north for two blocks, then turn left onto Riverside Avenue. Take Riverside northwest seven blocks, when you will pass 19th Avenue South. The entrance to the parking garage will be in the middle of the next block on your right. Taking light rail: The venue is situated on the Metro Transit Green Line. Whether coming from the east or west, exit the train at the West Bank station and use the stairs or elevator on the east end of the platform (toward St. Paul) to go up to the top level. Turn left on 19th Avenue South when you leave the tower, and the Humphrey School will be a block ahead on your left. Is it correct that the Conference Hotel is the Courtyard Hotel? Does the hotel have any special rates for conference participants? What time on what days will conference events begin and end, and therefore for which nights will I need to reserve a hotel room? Yes, the hotel is the Courtyard. We just got our group rate contract last week, and the accommodations page has now been updated with that information. The 2018 conference will start just after dinner on Friday August 24 and end mid to late afternoon on Sunday August 26. The Center for Inquiry is also offering Secular Celebrant training during the day on that Friday, but that’s a separate event from the conference. We’ll have a post up about that today.